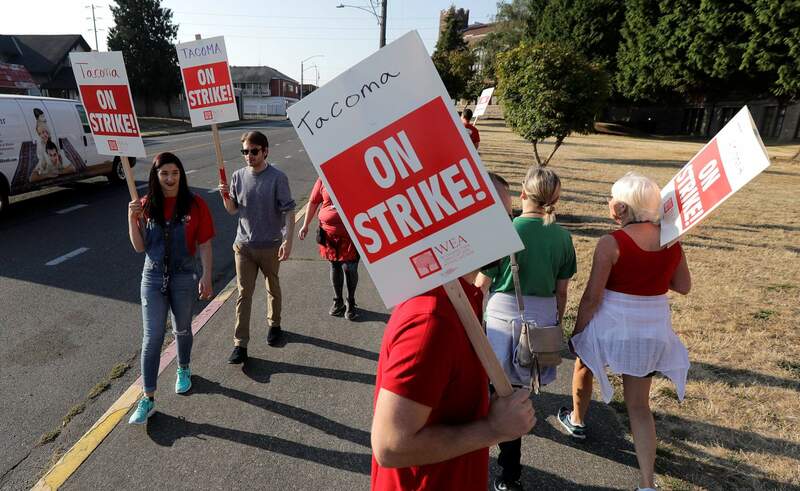 Striking Tacoma Teachers walk a picket line, Thursday, Sept. 6, 2018, in front of Lincoln High School in Tacoma, Wash. Fights over teacher salaries and work conditions are escalating along the West Coast, and the disputes are particularly acute in Washington, a state that has infused at least $1 billion for teacher pay to resolve a long-running court battle. 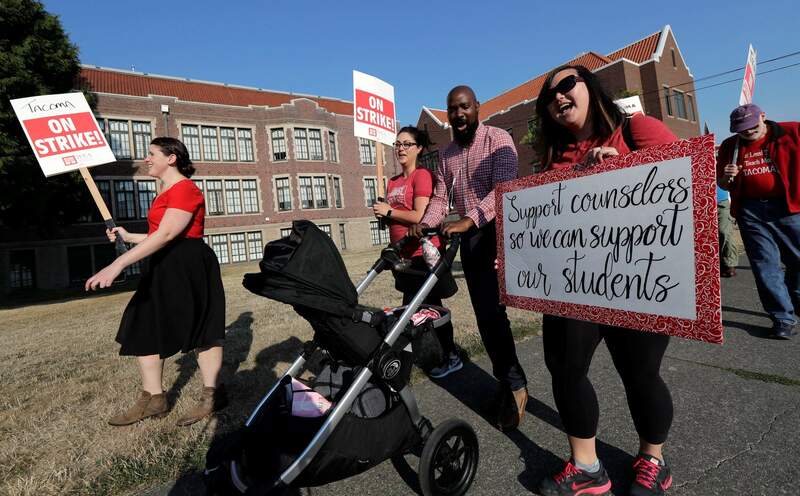 Striking Tacoma Teachers, including, from left, Hope Bixby, Megan Holyoke, Nate Bowling, and counselor Michelle Ha, walk a picket line, Thursday, Sept. 6, 2018, in front of Lincoln High School in Tacoma, Wash. Fights over teacher salaries and work conditions are escalating along the West Coast, and the disputes are particularly acute in Washington, a state that has infused at least $1 billion for teacher pay to resolve a long-running court battle. 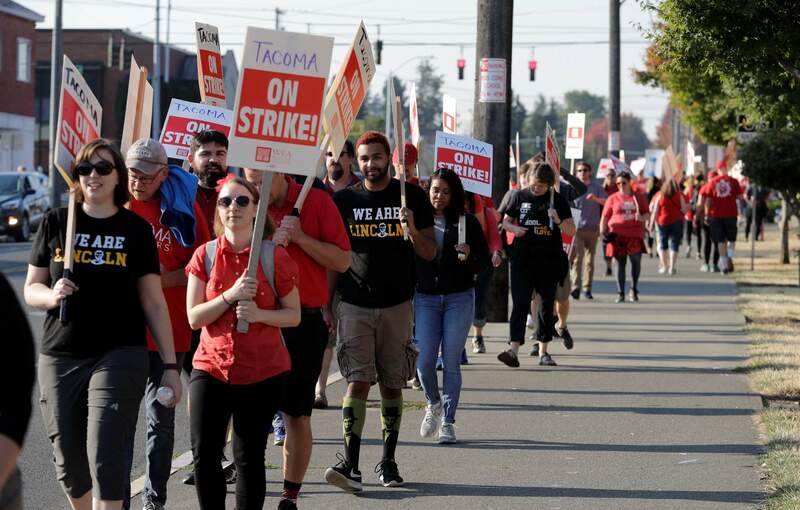 SEATTLE – Fights over teacher salaries and working conditions are escalating along the West Coast, emboldened in part by the momentum from widespread teacher strikes in more conservative states. The teachers in these blue states – with robust teachers’ unions, the right to strike and legislatures that are generally more supportive of education funding – are tapping into a shift in public sentiment that supports better wages for teachers that came as a result of the “Red4Ed” protest movement that began earlier this year. The latest disputes are particularly acute in Washington, a state that has infused at least $1 billion for teacher pay to resolve a long-running court battle. With students returning to school in the last few weeks, teachers in at least 18 public school districts so far have voted to authorize a strike, gone on strike or settled their strikes in order to get pay raises. “We saw everywhere from Arizona to West Virginia standing up for fair wages. Now that it’s coming to Washington state, we don’t feel isolated. We know we have the support of our local community,” said Connie Vernon, an elementary teacher in the Washougal School District in southwest Washington, where a nine-day walkout ended Thursday. Rich Wood, spokesman for the state teachers’ union, said local bargaining units at two-thirds of the state’s 295 school systems have sought to renegotiate salaries. In California, teachers in the Los Angeles Unified School District also voted last week to authorize a strike, although a walkout isn’t imminent. The union and district in the nation’s second-largest school system have failed to reach an agreement on pay raises, smaller class sizes and other issues. Both sides have filed charges against the other and a state mediation session is scheduled Sept. 27. The momentum earlier from teacher protests in West Virginia, Oklahoma, Kentucky, Colorado and Arizona has also carried into other kinds of actions, including an organized teacher hunger strike in Georgia and a major rally in North Carolina. Except for Colorado, all of those states have “right to work” laws, which limits the ability for teachers to strike. Teachers there instead scheduled widespread protest “walkouts.” In West Virginia, teachers won a 5-percent raise even though they lacked collective bargaining rights and had no legal right to strike. [imag:3]The Washington teachers’ union said it has been fighting for schools funding for more than a decade, and that the timing of their latest contract and strike discussions was coincidental to the national teacher uprising. Michael Hansen, an education policy expert at the Brookings Institution, said the teachers’ cause is undoubtedly helped by the political dynamics shifting in the national conversation about teacher value. As the protest movement moves from fiscally-conservative red states without much labor power, Hansen said momentum has shifted to more union-friendly blue states where pay and cost of living are substantially higher. The red-state fights thrived as state-wide actions, while the blue-state disputes are at the district level. More state money toward teacher salaries was funded by the Washington Legislature after a court ruling that stemmed from a 2007 lawsuit. The ruling said the state was violating its own Constitution by inadequately funding K-12 schools. This year, many of the teachers urged their school districts to reopen bargaining talks in the middle of their contract period in order to settle the pay disparity. Teachers at Seattle Public Schools, the state’s largest district, had authorized a strike but reached a one-year deal giving them 10.5 percent raises. In some smaller communities, school district officials have pushed back by suing the unions to get them to work. The state union is backing all teachers with a new political tactic, ordering for the first time “bargaining season” television, radio and Facebook ads to both put pressure on the districts and urge community members to stand with the teachers. One ad highlights the state’s teacher shortage while saying salaries aren’t competitive in a region flush with tech money. That’s also a show of force for the unions after a U.S. Supreme Court ruling in late June that declared government workers can’t be required to contribute money to labor groups. As the state teachers union flexed its political muscle by spending in such an unprecedented but high-stakes way, local leaders say their membership numbers have not been affected by the ruling even though it has the potential to significantly weaken the revenue base for all labor unions. Washougal’s superintendent Mary Templeton said the state union relationship with the locals has been affected by these broader elements and that it’s evident by the rush of political activity being carried out by the larger labor group. She said the district also wants to support teachers with a new salary pay scale. “We gave a lot because we know how important they are,” Templeton said.